Winter is here and there’s nothing better than a bit of spice on your plate to warm you up. So Elika (Instagram: @Sunny_Elika) and I headed to Rudie’s in Dalson after work one evening, starving, but filled with excitement for the Jamaican feast that laid ahead of us. Jerk chicken is one of our go-to dishes at food markets, and so we were more than ready to give Rudie’s a try. It was a chilly night, and as we entered Rudie’s we were greeted by some Jamaican tunes and kindly staff that warmed us up on the spot. We got in early enough to get a window table so that as we drank our Mai Tai (£7.50) and Jamaican Mule (£7.50) we were able to watch the world of Dalston go by. If you are a fan of rum, then the Jamaican Mule will not disappoint, and the Mai Tai will make you feel like the sun is blowing you kisses by the beach. 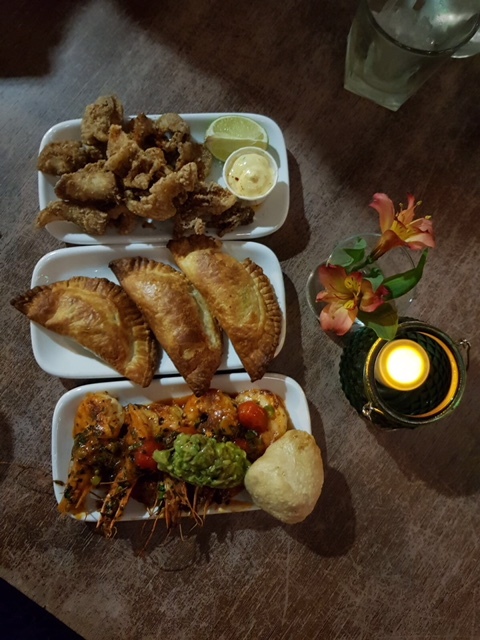 Rudie’s takes Jamaican food to another level, offering a more refined and contemporary approach to the more traditional Jamaican experience of jerk and spicy BBQ. We kicked off with the Peppered Shrimp (£8.50) for starters which was not for the faint of heart. We had been appropriately warned that these were hot, and this dish lived up to its reputation. The sauce was spicy and bold and served the plump juicy prawns very well. And although fiery, the intense, rich flavour of the dish was entirely worth the risk of the burn on your tongue. Topped with some avocado, this helped to balance out the heat of the dish. Rudie’s Jamaican Patties (beef £6) proved to be love at first smell, offering up a comforting and delicious aroma of homemade food that we found difficult to resist. The pastry on the patties was flaky, and the moist beef filling contained a hint of Jamaican curry which was wonderfully delicious. For those feeling less adventurous and looking for a more familiar option, we would recommend the Crispy Calamari (£7.50) which had been battered and deep fried in polenta. These were tender and crispy and had been sprinkled with a delicious jerk seasoning.